If God&#8217;s Presence is inside of me, how does that impact my life? If Jesus is my model, can I also walk in miracles and power? As you go through this study guide&#151;ideal for small groups, personal Bible study, and church classes&#151;Pastor Bill Johnson takes you on an unforgettable journey, answering these questions from Scripture and shows believers what it looks like to host God&#8217;s Presence in their everyday lives. Prepare to encounter God like never before and transform the world around you by hosting His Presence! Bill Johnson is a fifth-generation pastor with a rich heritage in the Holy Spirit. Together Bill and his wife serve a growing number of churches that have partnered for revival. This leadership network has crossed denominational lines, building relationships that enable church leaders to walk successfully in both purity and power. Bill and Brenda (Beni) Johnson are the senior pastors of Bethel Church, Redding, California. All three of their children and spouses are involved in full time ministry. They also have nine wonderful grandchildren. 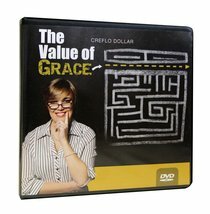 About "The Value of Grace"
Dr. Creflo A. Dollar is a much sought-after conference speaker, with books, CDs, audiotapes, and videotapes in worldwide distribution. Many of his works, including The Anointing to Live, Understanding God's Purpose for the Anointing, and The Divine Order of Faith, have been added to the curricula of Christian colleges across the United States. You can visit the Creflo Dollar Ministries Web site at www.creflodollarministries.org.